Unicameralism is back in vogue in Minnesota politics. For years, a small but vocal group of state politicians has proposed converting to a one-house legislature, as opposed to the traditional House and Senate. The idea has made little headway, but that may change now that Governor Ventura is the cheerleader-in-chief. SUPPORTERS OF A ONE-HOUSE LEGISLATURE say it's more efficient and accountable to voters; opponents say it skews the balance of power. Both sides point to Nebraska when they make their arguments. It's the only state in the union with a one-chamber legislature. See the Nebraska Unicameral Web Site. Nebraskans are proud of their unicameral legislature. 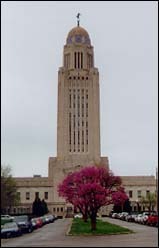 Their Capitol, an art-deco tower rising 15 stories from the prairie, is a monument to their decision in 1934 to be different from other states. Tour guide Libby Blase stands in front of the closed doors of the old Senate chamber and explains why it's no longer used for law-making. "When this building was built, when it was finished in 1932, we still had the two-house system, the bicameral," she says. "The east was our Senate, the west was our House of Representatives. In a state-wide election in 1934, George Norris and others say, 'there's a better way to do government. We could save money, it would be more efficient, it would be more efficient.'" The Nebraska Legislature consists of 49 senators, who meet every winter and spring in the old House chamber. The Speaker is Doug Kristensen, a Republican lawyer and, like everyone in this building, a fan of unicameralism. The chief advantage, he says, is that Nebraska voters know whom to hold accountable. Speaker Kristensen says he's glad he doesn't have to worry about making deals in conference committees. When talking about the Nebraska system, it's hard to separate unicameralism from the other distinction of the legislature in Lincoln: it's nominally non-partisan. That means candidates are not identified as Democrats or Republicans on the ballot, and once they get to the legislature, they're not allowed to form party caucuses. Without party caucuses, there are no caucus leaders - no majority leaders or minority leaders - and individual senators have a lot more leeway to vote as they see fit. Some lobbyists say the non-partisan independence of the Nebraska legislators sometimes makes their jobs harder, since they have to do more than just convince the majority leader to see things their way. One lobbyist described the Nebraska legislature as being made up of "49 generals." But some observers say lobbyists have it easier in the Nebraska system. Des Moines Register Reporter Tom Fogarty covered the legislatures in both Nebraska and Iowa, and he prefers the two-chamber, partisan system. Fogarty says the lack of party structures in Nebraska makes the senators more vulnerable to pressure from lobbyists. I think that, when a legislator is approached, that legislator can use party concerns to fend off requests from a legislators," says Fogarty. "I mean, from a lobbyist, even a lobbyist who may have been a big contributor at election time. I think the accountability comes with the parties." In Minnesota, Governor Ventura often rails against legislative overproductivity, and he might be surprised and dismayed at the number of bills passed by a unicameral Minnesota Legislature. Of course, the governor could veto those bills, but vetoes are less final in the unicameral system. The result is what many political scientists consider a weakened executive branch, possibly another unwelcome surprise for Governor Ventura, should Minnesota follow Nebraska's lead. The change would require a constitutional amendment, which means both the House and Senate would have to vote to put the question on general election ballot. Legislators are generally skeptical - if not downright hostile - to the idea. Discussion of unicameralism is not likely to begin in earnest until the current legislative session ends this spring.